this weekend, which honors the gay-rights work of married couple Don Roos and Dan Bucatinsky. A story on their lives can be found at independent.com/pride. Jane Lynch said some of the most offensive lines in television history as Sue Sylvester, cheerleading coach on the award-winning show Glee, which just wrapped its six-season run March 20. For example, “I don’t trust a man with curly hair,” she once told the choir teacher. “I can’t help picturing small birds laying sulfurous eggs in there, and I find it disgusting.” Although the clever dialogue was penned by show co-creater/writer Ian Brennan, it was Lynch’s straight-faced, deliberate delivery that brought it to life and made what could have been the most despised character a fan favorite. I recently spoke over the phone with the actor — who is personable, polite, and quick to laugh — in anticipation of her April 25 visit to Santa Barbara, when she’ll host Pacific Pride’s annual Royal Ball fundraiser. How did you become the host for this year’s Royal Ball? Don Roos and Dan Bucatinsky are very good friends of mine, and they are being honored at the ball. I was going to support them anyway, and then they asked me to emcee, which I was happy to do. I have worked with Pacific Pride before. They are a great organization. How was ending Glee? Well, the last three days it kind of hit us; we started doing a countdown, as it were. We knew at the beginning of the season that we only had 13 left, so we were kind of prepared for it, but it was still very emotional — a chapter in all of our lives we will never forget. The lines your character got to say were brilliant. Ian Brennan is the brilliant writer who wrote almost everything that came out of my mouth. He created me. I am his Frankenstein. How was it playing a character that wasn’t particularly well-liked? She was loved [laughs]. She ended up being beloved, and I think that’s because she’s not dangerous; she’s ridiculous. 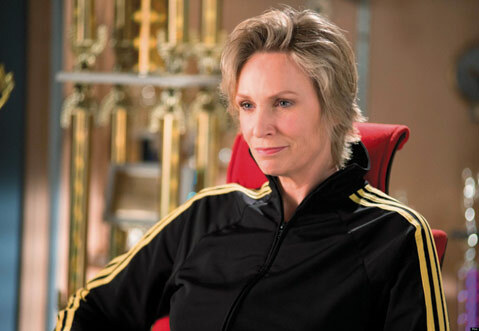 I think there is a little Sue Sylvester in everyone. She says the things everybody wishes they could say and then are really glad they never did. The show was out of the box in terms of characters. What was great about it is that [Ryan Murphy] actually went archetypal when he created it, and you put good actors in kind of like an archetype, and then you’ve got great living, breathing people that kids can relate to. There was someone in that choir room that you could identify with, maybe even several, and maybe it changed from week to week. You’ve played serious roles, funny roles, you’ve been on every show I love — 3rd Rock from the Sun, Psych. How did that come about? I don’t know. I didn’t plan it. It just happened. Any time anyone asks me for advice, I say, “Don’t plan. Don’t have goals. Just stay open and keep working and try to keep having fun.” Truly, I think that’s the key to it. Has the industry changed for women, gays, minorities? I don’t look outside in. I really don’t. All I have is my personal experience, and it doesn’t matter. I know in the old days, it was people like Ellen DeGeneres, Melissa Etheridge, and k.d. lang and all those people who at the height of their careers said, yes, I’m gay, and took that chance, and kudos to them. Are you already on to other things? Yes. I just finished shooting a pilot for CBS called Angel From Hell, and I just did 10 episodes of Hollywood Game Night that will air July 7. Jane Lynch will host Pacific Pride’s Royal Ball Saturday, April 25, 7 p.m.-12 a.m., at the Bacara Resort & Spa (8301 Hollister Ave.). For tickets and information, call 963-3636 x111 or see ppfroyalball.com.